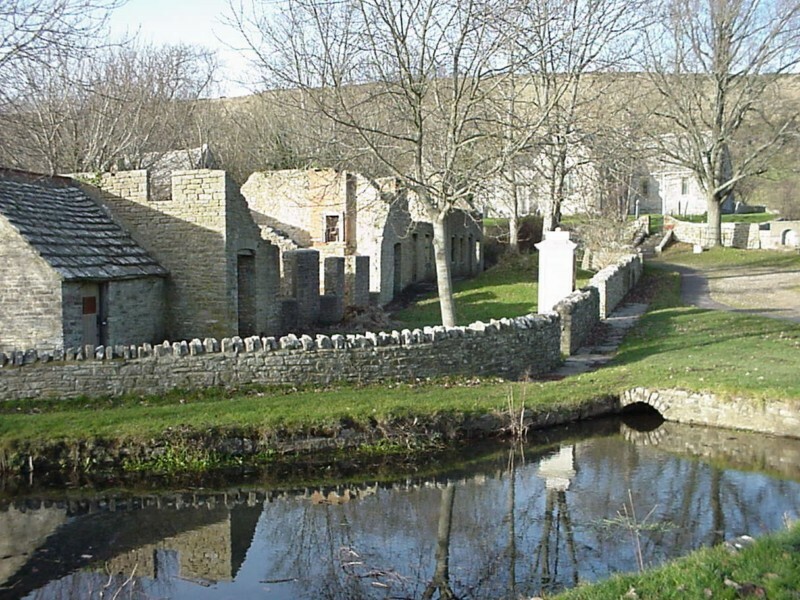 The final place I visited during my weekend in Dorset was the deserted village of Tyneham. 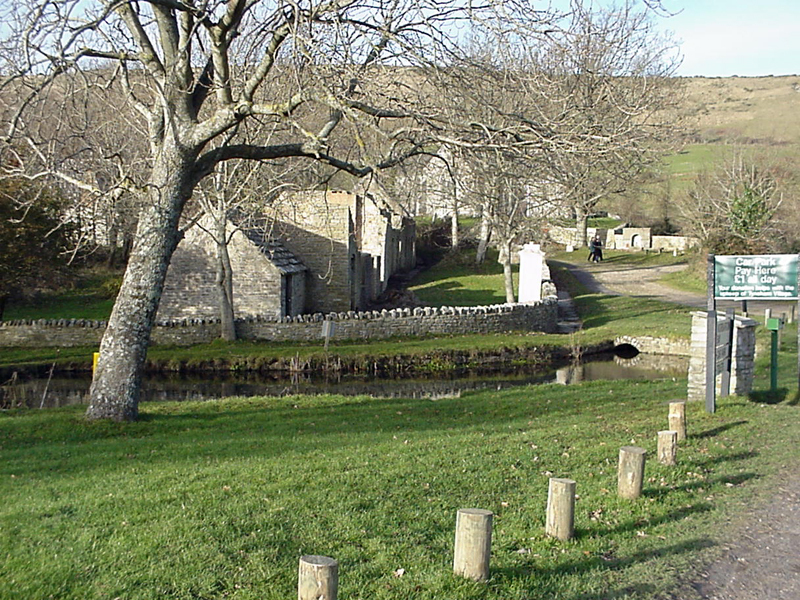 Tyneham is a small village in Dorset, close to the coast, and a few miles to the west of Corfe Castle, on the Isle of Purbeck (which is not actually an island, but a headland). 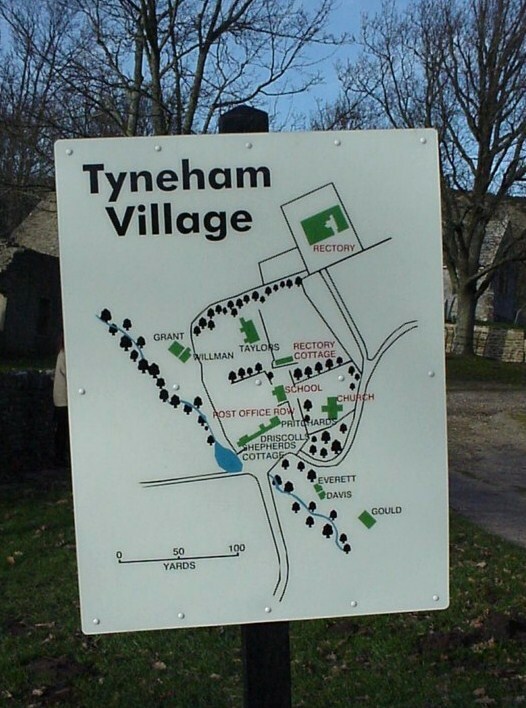 Tyneham has a fascinating history. It is now a 'ghost village'. This means that the village now has no inhabitants, not that it is occupied by ghosts! In 1943, in the middle of the Second World War, and on the orders of the War Office, the 250 villagers were told to pack up their belongings and move to new housing in nearby Wareham. 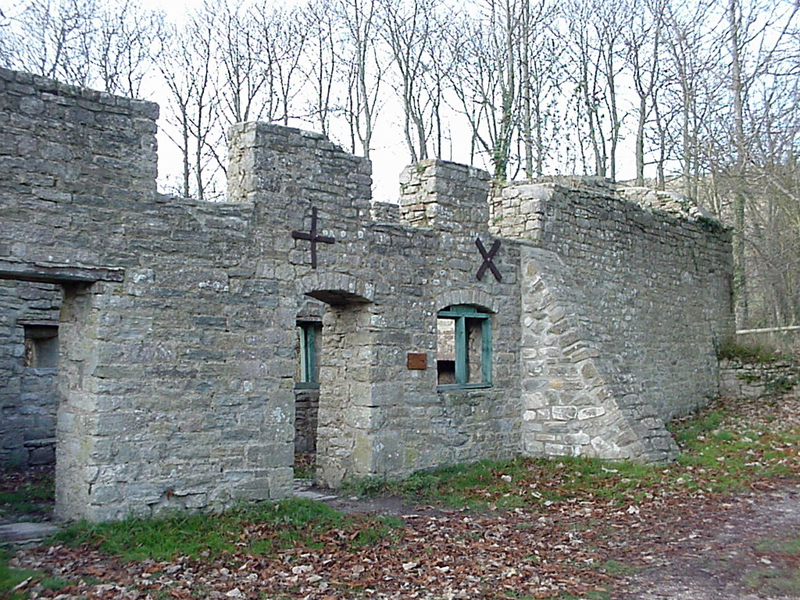 The surrounding area was already in use for training soldiers, and this village was now considered to be too close to the firing ranges being used to train new troops in firing weapons and driving tanks. 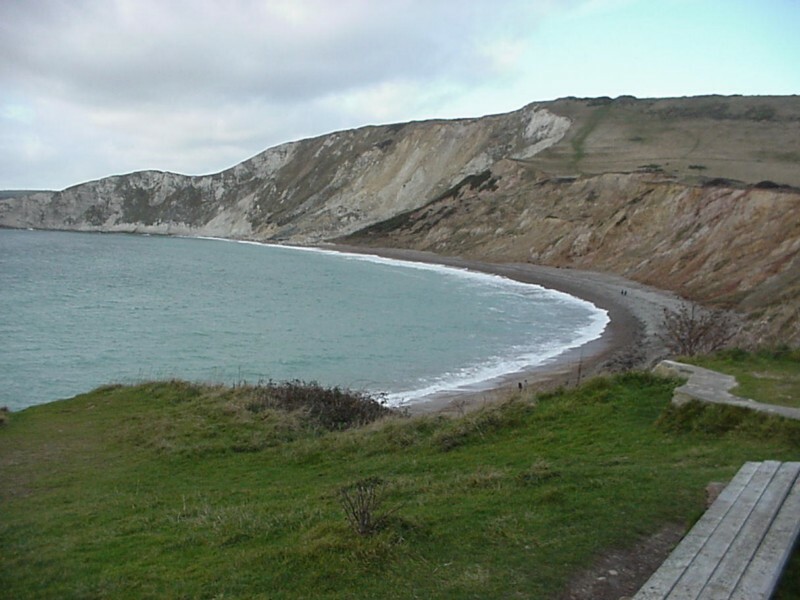 Since the early 20th century parts of the area had been used as testing grounds for the first tanks and this isolated stretch of coastline still has an army presence to this day. Sadly the villagers never returned. In 1948 it was finally decided that the army would remain and the land was then purchased by the Ministry of Defence who still use it to this day for training. Some of the villagers objected and an inquiry was held, but other villagers by this time had settled elsewhere and did not wish to return. Over the years most of the buildings have gradually started to fall into disrepair. However the local Portland stone is quite strong and many walls are still standing. In fact this stone is famous for its quality and has been used in many well-known buildings in London, and has even been used in the United Nations Headquarters in New York. 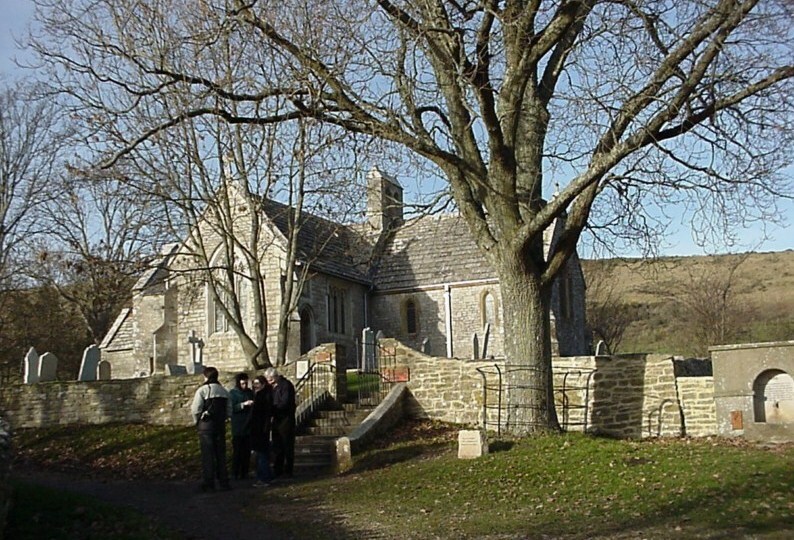 Two buildings (the church and the schoolroom) were preserved and can be visited today. You can see the church in this image. The lovely old church has a peaceful atmosphere and beautiful stained glass windows. Nowadays the church also houses displays relating the history of the village. On one of the displays I noticed this photograph of a couple who used to live in one of the houses. Most of the men in the village were fishermen or farm workers. 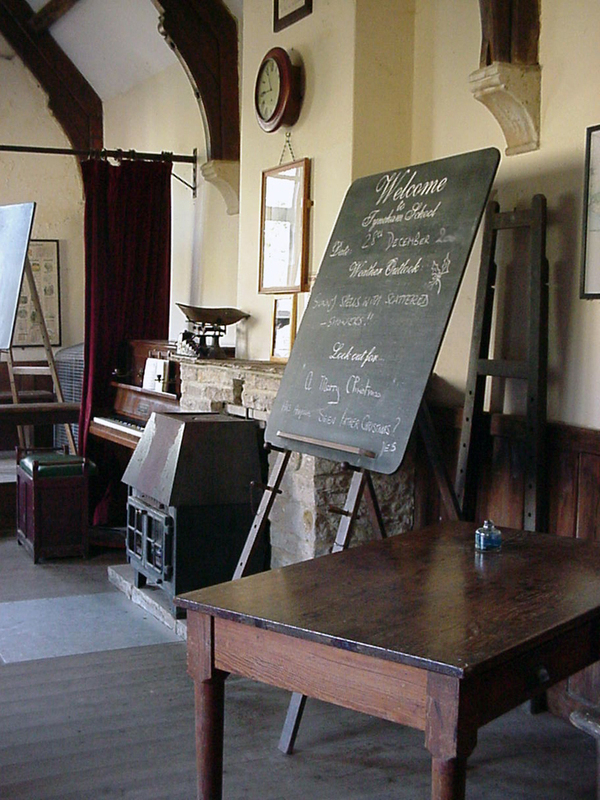 The village school has also been preserved, and is also open to the public. It still has all the original furniture and fittings. 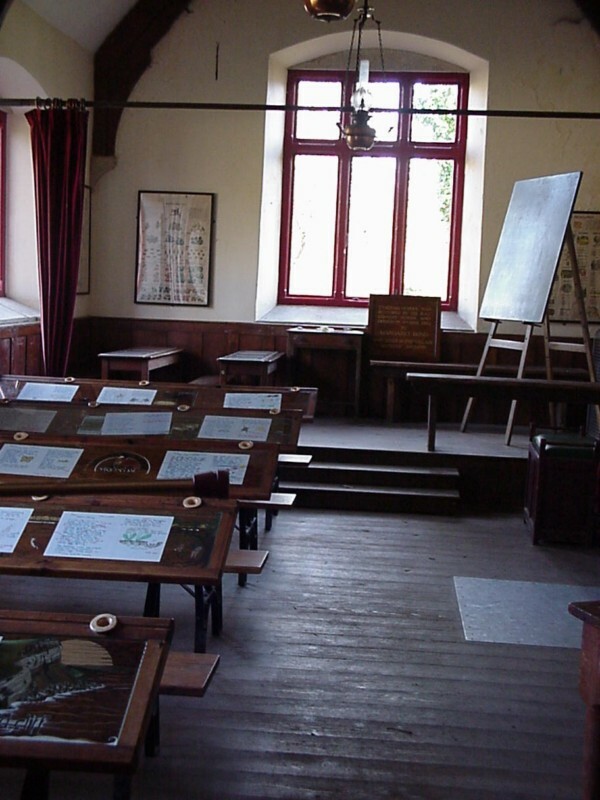 On each desk (and safely preserved beneath a sheet of protective plastic) are essays completed by the children who studied at this school before it closed. I loved these essays, which give a charming glimpse of a rural childhood of the time. I have copied them out but I am guessing with some of the words! 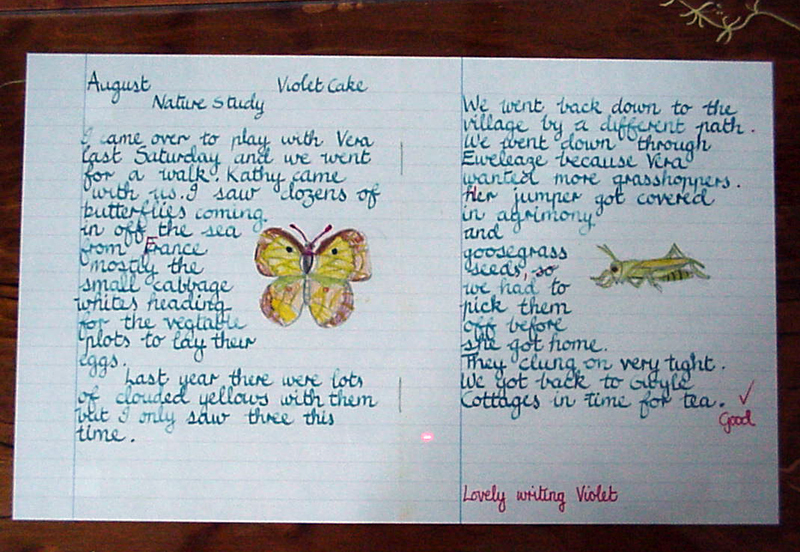 This essay was written by a girl called Violet Cake. The teacher had commented ' Good, Lovely writing Violet'. Nature Study. 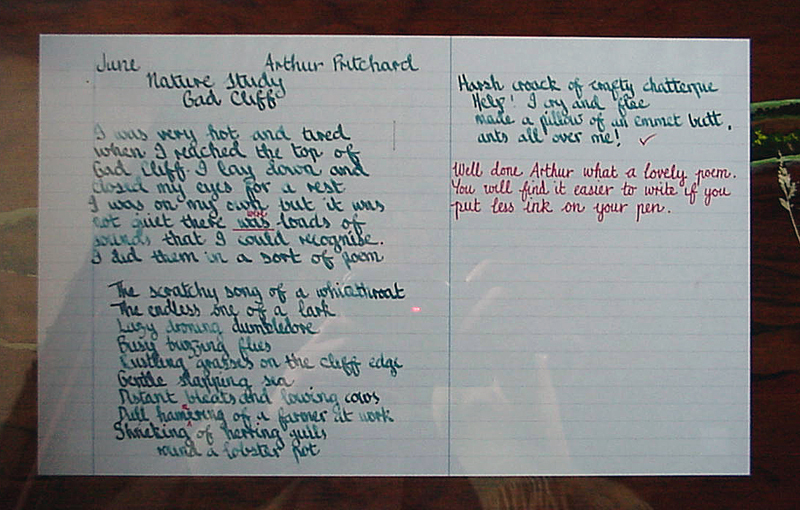 Gad Cliff. I was very hot and tired when I reached the top of Gad Cliff. I lay down and closed my eyes for a rest. I was on my own but it was not quiet there were loads of sounds that I could recognise. I did them in a sort of poem. 'Nature Study on Gold Down. Last Saturday I went for a walk with Very and Violet up Gold Down. We went down the path by the farm and climbed the old road to the top of the down. We sat on the grass watching the birds. It was a really lovely day. The thistle fields were full of little birds twittering about. Violet says they were pipits and linnets. I knew stonechat as soon as I heard his warning call, like two pebbles being bashed together. When it was time to go home, Vera saw the old Gad Cliff vixen creeping around above us on the coastguard path. She slipped over the edge of the hill to her den. As we went home we saw a yellowhammer sitting on top of the bar gate shouting 'little bit of bread and no cheese'. 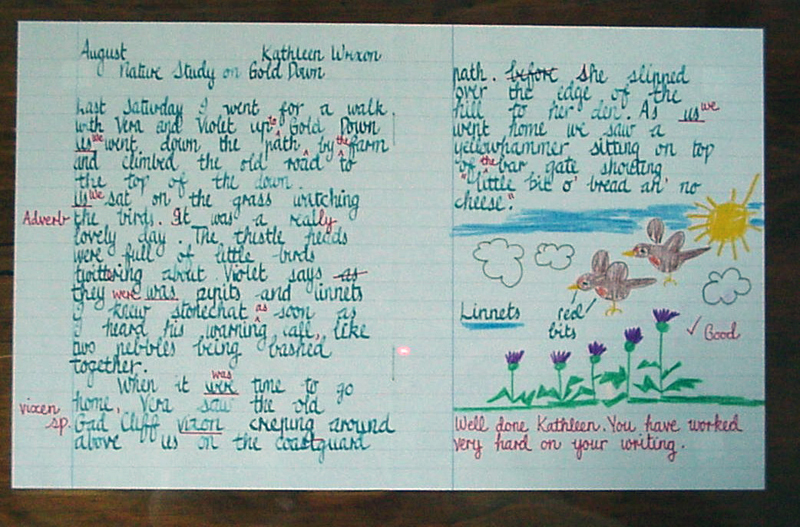 The teacher had commented ' Well done Kathleen. You have worked very hard on your writing'. The yellowhammer is supposed to have a song that sounds like the phrase ' a little bit of bread and cheese' in case you are wondering! The village is set back slightly from the coast. 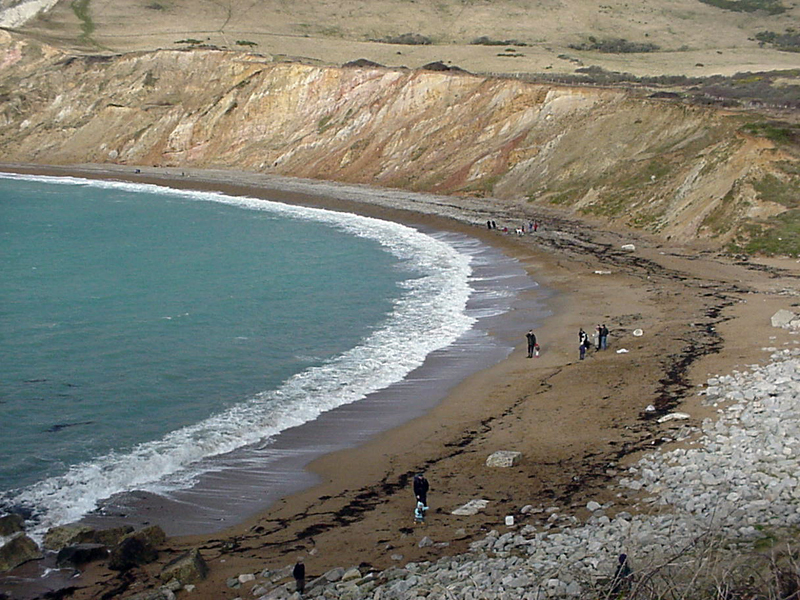 There is a pleasant walk down to the beach through an unspoilt valley. 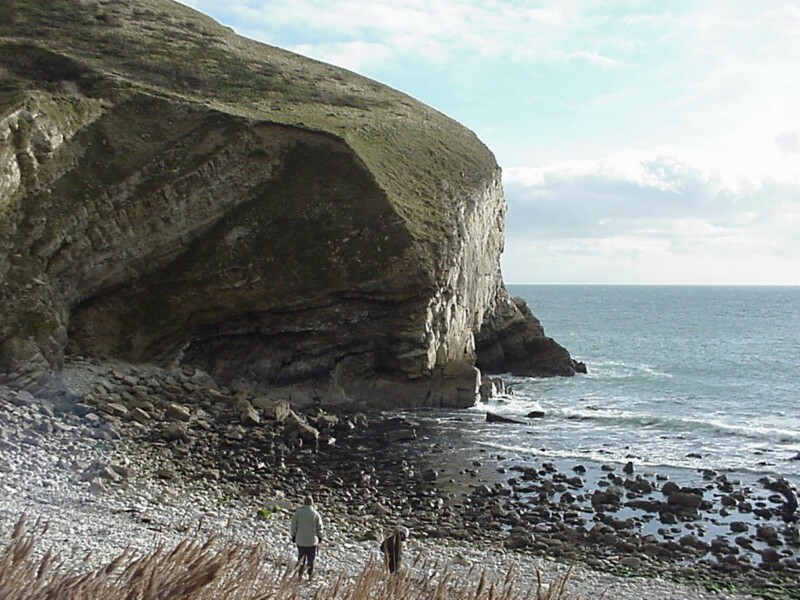 It is unusual in this part of the world to see a stretch of coastline with no development at all, so this in itself makes the walk interesting. 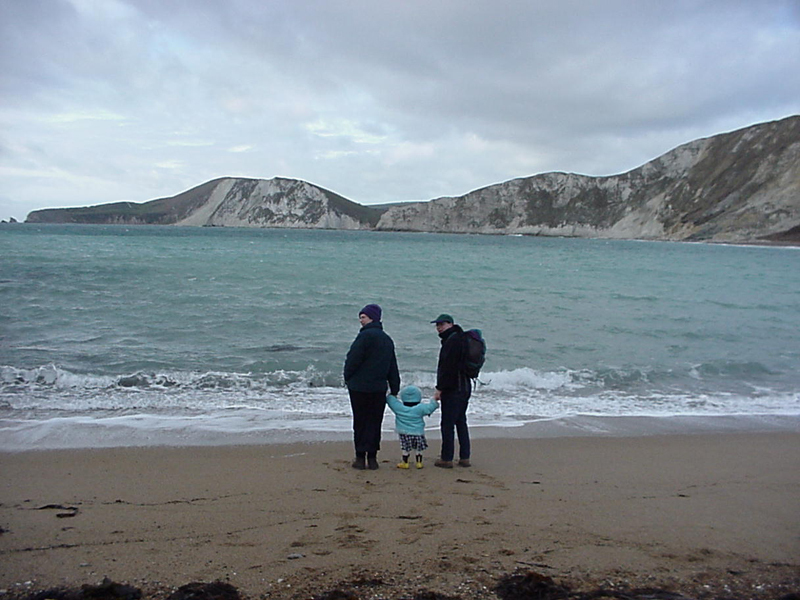 It is possible to find fossils on the beaches in this area. Perhaps these people are fossil hunting. 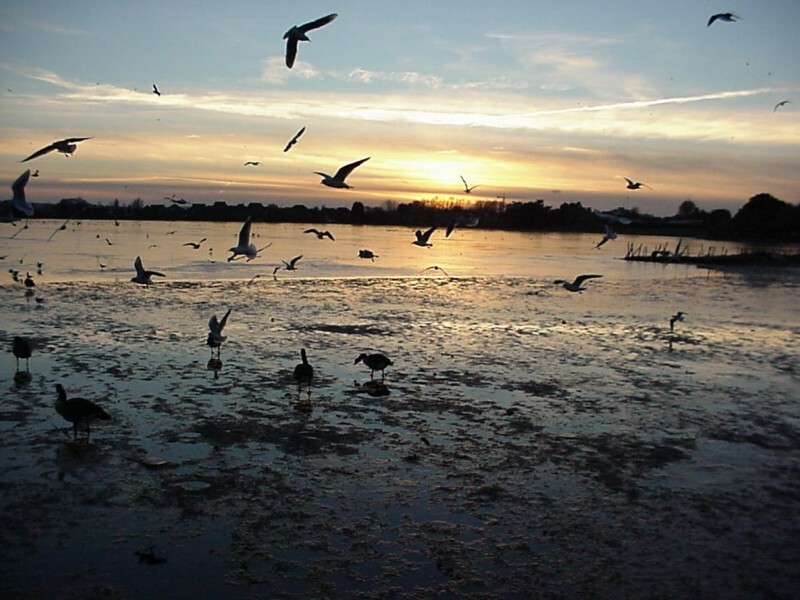 Just enough time to stop and view a lovely winter sunset on the way home.